When working with a set of knives in varied settings, one needs appropriate sharpening tools for these. Something to carry along would be the best. If you want a lightweight, portable device to sharpen your knives wherever you may carry them, consider the BladeMedic knife sharpener from Lansky. It is cheap and small. Thankfully, it does succeed in restoring edges. Lansky produced an efficient portable knife sharpener. It’s so easy to take it along and use it in the wild. You may expect it to have very limited features, but that’s not true. It is equipped with all that it needs to handle many types of blades. The device features two stages. For the first one, the tungsten carbide grits the blade to give it a better edge. The second one uses ceramic rods for a fine result. These finish the edge in a few strokes. The combination of these two stages is enough to restore the functionality of a dull straight edge. For serrated ones, there is a separate ceramic stage. Lanky PS-MED01 was created for quick sharpening. It’s so fast and efficient it only takes 3-4 strokes to restore the edge of a blade. The process is simple, you will quickly learn how to use it. You can choose from its various features. If you are in a hurry, you can just use the ceramic stage to give a better edge quickly. With this tool you will be able to restore more types of blades than you’ve thought. Moreover, you can use it out there when camping, trekking and so on. This small tool also incorporates a diamond-tapered rod. It can be used for both finishing and for emergency reconditioning. It is perfect for touch-ups. The rod can help you recondition a blade in a very simple manner. This is an excellent all-in-one piece that’s so different from all the others. On Amazon, this Lansky gadget succeeded to impress almost 300 buyers. It got a rating of 4.4 out of 5 stars. Most users remarked its versatility. The sharpener even helped them with their Victorinox pocket knives. The cross section of the ceramic bar (used on serrations) is widely appreciated. The diamond rod can also be used on serrations – only with more care. Some have mentioned the kit’s metal body as a downside. The device is not made of plastic, as many might expect. Thus, it tends to be a little heavy. It is not a major problem though, since it is able to replace so many different sharpening tools. 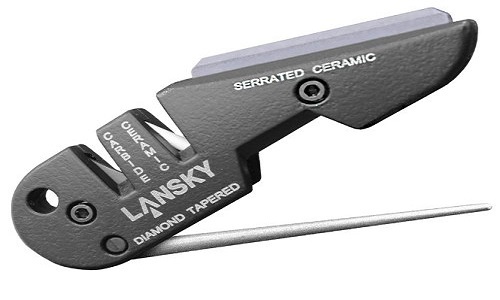 Lansky’s BladeMedic is an economical knife sharpener. It groups several sharpening and reconditioning tools in one and it is really cheap. Also, it’s a portable device, good for sports and outdoors enthusiasts. At the same time it is ok for kitchen use. It ensures that every blade edge is quickly sharpened whenever needed. But don’t expect big from $11 tool either.